Myanmar is highly vulnerable to climate change and was placed second place globally in terms of vulnerability from extreme weather events in the period 1991-2010. However, when compared to many other countries in the region, it is currently much less prepared to respond to the challenges posed by climate change. The potential impacts of climate change and the current low state of preparedness necessitates an overarching response. A proactive approach to addressing climate change will safeguard Myanmar’s economic, social and environmental development goals and reduce the risks from potential climate change. Myanmar is to receive financial support under the Global Climate Change Alliance (GCCA), which was launched in 2007 to strengthen dialogue and cooperation on climate change between the European Union (EU) and developing countries most vulnerable to climate change. 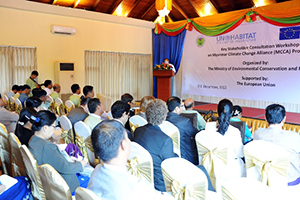 The Myanmar Climate Change Alliance (MCCA) programme has been designed to strengthen capacity in Government, private sector and civil society actors and to facilitate the Government in preparation of a national strategy for climate change that will result in sectoral strategies and actions to address climate change. Further the programme will support the development of appropriate institutional structures within Myanmar to implement climate change projects and programmes. The Overall objective is to mainstream climate change into the Myanmar policy development and reform agenda. To strengthen the climate change related institutional and policy environment through sharing of technical knowledge and best practice, training and institutional support. The MCCA will support the establishment of a project steering committee which will be co-chaired by (Ministry of Environmental Conservation and Forestry) MoECAF and the EU. 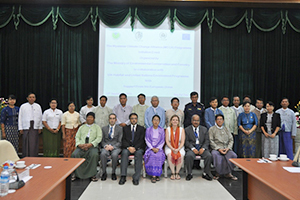 A Myanmar Climate Change Alliance Unit (MCCAU) housed within MOECAF will provide technical and administrative support for the strategy development. The Sectoral technical working groups (TWGs) will prepare sectoral strategies and action plans for integrating climate change into national development plans. Community-based projects will be implemented to support integration of climate change into bottom-up development planning. Participating communities will be consulted on the effects of climate change in their communities including livelihoods and identify adaptation options to deal with climate induced impacts, and will receive capacity building on how to practically integrate climate change adaptation measures into community development planning. Learning from pilot level demonstration of adaptation measures at community level will be captured to inform the policy making process. Expected result 1: Government, civil society and the private sector in Myanmar are more aware of the implications of climate change. Expected result 2: Government has the capacity and support needed to integrate climate change considerations in policies, strategies, plans and operations and civil society capacity to contribute to climate change activities is enhanced. Expected result 3: Lessons drawn on climate change from sub-national and local level activities inform policymaking and are communicated to relevant decision-makers in the relevant sectors.